The Long Days Time, also called Strong Sun Moon, is the first of the three cycles of summer. During this time, the ground warms, the clouds part, and the earth is enlivened with lush vegetation, wondrous fragrances and the expectation of fulfillment of the promises of spring. The totems for this month are flicker -- a type of woodpecker -- rose quartz and wild rose. The element for this cycle is water and the clan is frog clan. The solar influence of this cycle is the south-east and people born in this time are carried into the world on strong south winds. These warm currents are very maturing and operate in a spirit of innocence and trust. Innocence, in this context, is an awareness of Unity and is a condition of the Higher Nature which enables them to trust that they will develop and mature according to the Divine Seed within them. These people can easily develop the traits of impartiality, objectivity and non-attachment, and have the potential to manifest the kind of deep wisdom and divine love that can change the world. Individuals born in this cycle learn best “up close and personal” and, hence, value and learn well from direct experience. Guided by their feelings, getting close to people and things is their natural way. Because of this characteristic, some natives used the mouse as a totem for the south due to the powerful sensing ability they have in their whiskers. The animal totem for this cycle is Flicker, which represent rapid growth, trust, and the ability to manifest all-healing love. Flickers, like all woodpeckers, tap out a rhythm, connecting us to our heartbeat; to our own dance of life. And, like the drummers of old, they can also usher in altered states, allowing us to perceive things differently. People with Flicker medicine have natural music abilities and are very good at shifting perceptual states from one level to another. If you feel “out of sync” with the earth, with others, or the rhythm of life, call on flicker to help you find the beat. 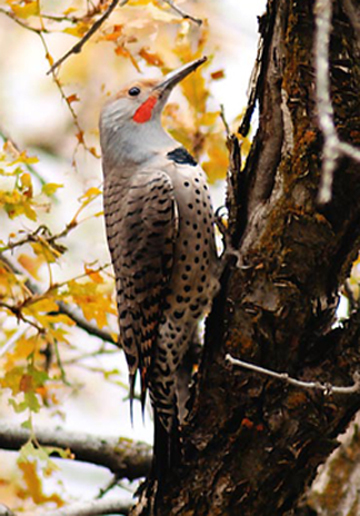 Flickers have powerful bills and long tongues, with which to extract bugs and other nourishment from the trees. Likewise, Flicker can help you extract nourishment for your own soul out of the things around you. Another application of their skilled mouths is the ability to heal through words. Flicker medicine can help pastors, counselors, or anyone who needs assistance in using their mouths and words in a more productive or healing manner. Flicker also has feet that differ from most birds. With two toes in front and two toes in the back of each foot, they are particularly adept at maintaining balance on the side of trees. If you have any lop-sided viewpoints or feel out of balance in any way, Flicker can help you find or regain your balance. Flicker can also help you hold tight and stay focused on the goals and tasks you wish to accomplish. So if you have trouble sticking with one thing very long or feel that you never get ahead, call on flicker to lend you its ability to grab tight. This powerful grip, however, can also cause one to cling too tightly to people, things -- even beliefs and concepts. So those with Flicker medicine would do well to work toward consciously maintaining a state of open-mindedness and non-attachment. Woodpecker people have powerful instincts and a sensitive emotional nature. Their primary life function is to assimilate experience, drawing wisdom and knowledge to themselves. By doing so, they learn to harness the intense powers within and obtain emotional balance. Those who succeed are among the most powerful of healers. If they fail, however, their strong drive toward love and emphasis on commitment can lead to feelings of turbulence and great unhappiness, even causing some individuals to become twisted. The mineral for this month is rose quartz. Rose Quartz is a gentle pink color which brings a soothing feeling like a soft and fluffy cloud. Rose Quartz is best known for strengthening the heart chakra, easing the troubled heart, and removing barriers to love. It is also said to enhance one’s appreciation of beauty in all forms. The Wild Rose blossoms from May through July and has been accessed for centuries for its medicinal properties. 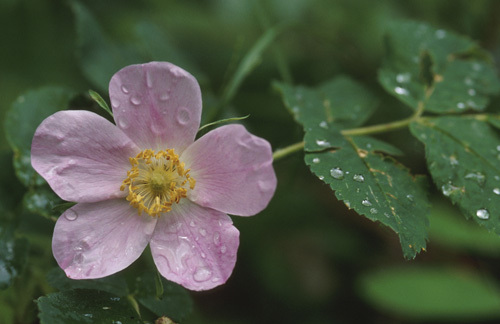 Wild Rose may be taken for headaches, as well as a tonic and blood purifier. High in Vitamin C, it can also be used in the treatment of colds, flu, and sore throats. Wild Rose is a gift to the senses. Beautiful to behold, it can also be made into an oil and used as a perfume or air freshener. Most importantly to my own work, Roses have agreed to be energy clearers and, as such, have been used by practitioners of magical arts and lightwork for centuries. Like the rose, people with this plant totem bring beauty, harmony and freshness into the lives of others, but be careful for their prickly side!